I like games that involve developing or building something. I’m not into racing other players, or shooting enemies. I’d rather create a civilization or build a city. My favourite game on my phone right now is SimCity BuildIt. If you ever played SimCity on a desktop, it’s the same idea. 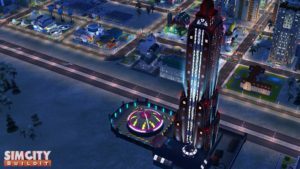 (You create a simulated town and work on developing it into a successful metropolis.) I think I like the app version better though. Some aspects of the game are simpler, but there are lots of things to keep you interested. Increasing your population (and tax revenue). Making your city a trading powerhouse. 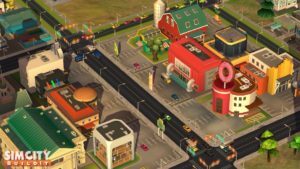 Fine-tuning your town’s infrastructure (like roads, factories, and utilities). Developing specialty zones (like beachfront properties or mountain resorts). Completing specific “city achievements” for in-game rewards. Vu Tower, from which you can launch disasters on your city, via mad scientist. Plus, if you like a little mayhem, you can call disasters down on your town. You even get rewarded for cleaning up the mess. Anyone out there already playing? Let me know if you want to connect on Game Center. And if you’ve got any recommendations for other games like this, please let me know! Next story Who Benefits from Your Financial Activity?